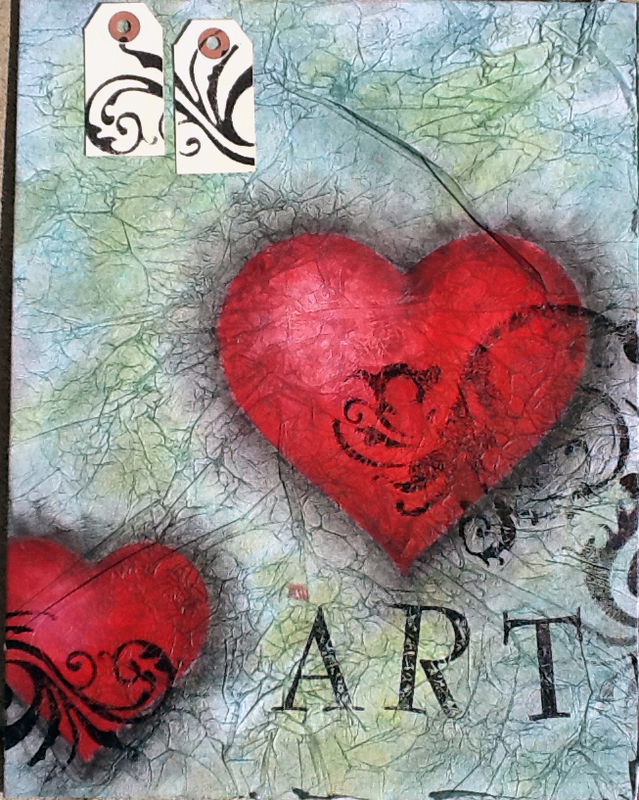 I wanted to share my amazing class I took last week with Donna Downey mixed media artist and international teacher. daughter. My oldest daughter is the studio manager for Donna and set me up for the class. I have to say Donna and her husband Bill are the most fun and friendly people!! Me, Donna and M, who is really that tall.....6 foot!! My canvas looks more like the original and M did her own artistic thing....I like hers better of course!!! they are amazing...you have to check it out. Donna Downey is a bestselling author, instructor and all-around creative force as a mixed-media artist. In 2000, she got into scrapbooking as an extension of her paper product and photography addiction. This was only the beginning. From working as a popular columnist for Simple Scrapbooks magazine, to traveling the world inspiring women to push the boundaries of their own creativity, to developing her first mixed-media scrapbooking line with Prima in the Spring of ‘09, Donna is consistently on the leading edge of taking creative risks the push the creative envelope and empowering others to do the same with their art. As a mixed-media artist, Donna is a born experimenter, blending and transforming both traditional and unexpected items into meaningful pieces of self expression. A former elementary school teacher, she has synthesized her first love of teaching with her passion for craft and brings this to women via workshops at scrapbook stores and events, writing books, and through her popular blog and website. Donna lives in North Carolina with her husband, and is a mother of three exceptionally blonde children, a chihuahua and one blonde dog. "All things material can be creatively transformed into a personal piece of artistic interpretation. That creativity is not a measure of skill, but a passion. That art comes from within and is a visual extension of ones self. That everyone is perfect just the way they create. That art cannot be defined, but rather is defining." Those are lovely- how fun to be able to do this with your daughters! Thank you, it's nice to be able to spend time with them and for them to enjoy it too! What a lovely piece, and how nice to have a daughter to do such things with you. I like hers, too. I linked from Richard's LAFF. Thanks, I do love to spend time with my girls!